Today’s “Entertaining & Economical Excursion” takes us to a part of the historical center of Guadalajara to view fabulous murals and other art in a beautiful neoclassical building, all for the great low price of free. 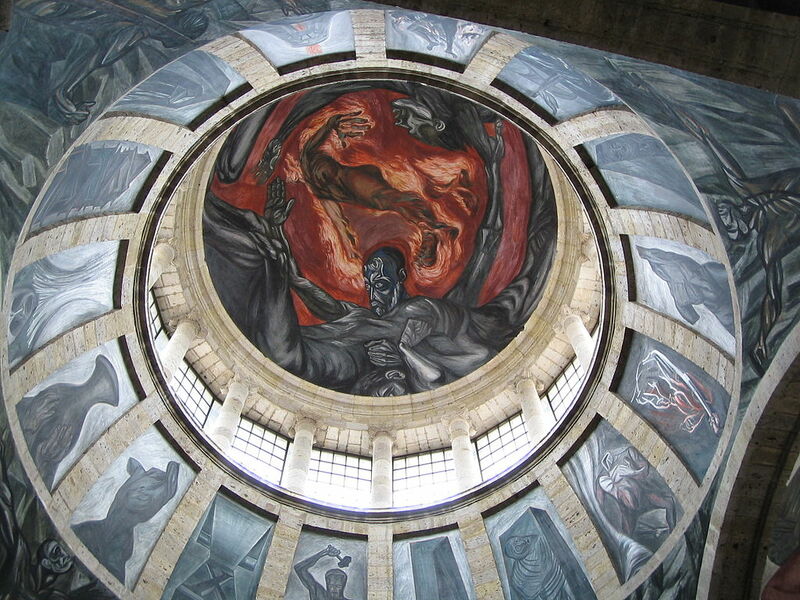 We are, of course, primarily referring to the famous murals painted by José Clemente Orozco inside the Hospicio Cabañas in the late 1930s, and once a week you can relish in their intensity, vividness, and plain awesomeness without having to worry about the cost of admission. But first, some history. Knowing just a little bit about a historical site helps one appreciate it all the more, we find. 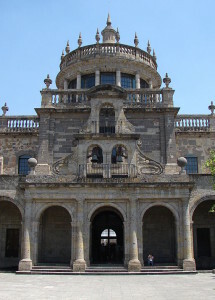 The Instituto Cultural Cabañas, better known as the Hospicio Cabañas, was founded as a refuge and place of learning for orphans, invalids, and the elderly, by then acting bishop Juan Cruz Ruiz de Cabañas y Crespo. Construction began in 1805 and terminated in 1845. While its mission was interrupted twice by war, first by Mexico’s War of Independence in 1810 when it was co-opted for use as a military barracks and then 100 years later by the Mexican Revolution when it became an asylum for political refugees in 1910, it served its original purpose until 1980 when its inhabitants were moved to new locations and it finally closed its doors. 1937 saw the invitation of José Clemente Orozco to Guadalajara by the government of Jalisco to paint the chapel of the Hospicio Cabañas. Through early 1939, Orozco painted some 53 murals on the inner walls, vaulted ceiling, and dome of the building, portraying key historical moments including the clash of indigenous peoples and the Spanish and the founding of Guadalajara, as well as harsh interpretations of modern life. His most widely recognized piece here is “Hombre en Llamas”, painted in the cupola itself. In 1983, the now restored building opened its doors once again, this time as a center for cultural development, enrichment, and promotion. It currently houses not only the famed Orozco murals but collections of Jaliscan painters and sculptors, hosts numerous national and international art expositions, screens movies, and offers art classes to the general public. The best day for a visit to see the murals and other art is a Tuesday as this is a free day – that’s right, they don’t charge admission on Tuesdays. The normal $70 MXN per adult is waived (students with identification normally pay $35 MXN) and you can march right on in between 10am and 6pm and view the murals, other installations, and grounds for as long as you desire. The awe-inspiring murals alone are worth it. After that, you can walk due east through the various plazas toward the Cathedral of Guadalajara in Paseo Hospicio which becomes Calle de Morelos, enjoying the sights along the way, or head one block due east to the giant fountain in Plaza Tapatía and then one block due south down the stairs to get to the massive San Juan de Dios market for a bite to eat and some shopping. The Plaza de los Mariachis is right next door as well. Just use common sense and watch your valuables while in the area, especially in and around the market. To get to the Hospicio Cabañas, order a taxi or an Uber or catch the 400 or the 500 public bus going east in Avenida Hidalgo. Once you cross Calzada Independencia Sur, Avenida Hidalgo will become Calle República. Continue one or two more blocks east and you’ll arrive at your destination.